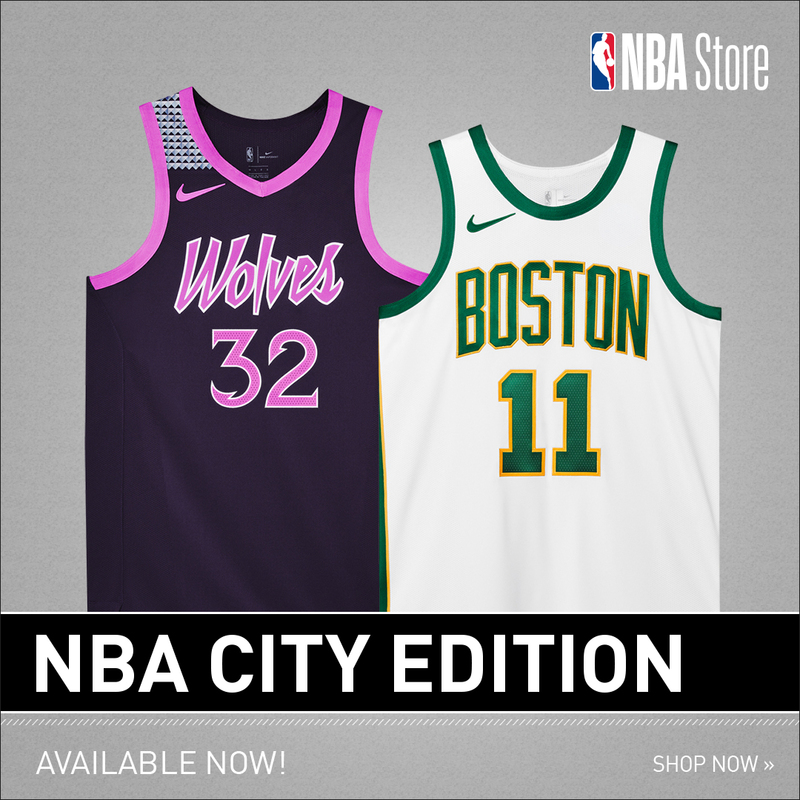 Last week, a handful of NBA teams released the latest versions of their City Edition uniforms in collaboration with Nike. 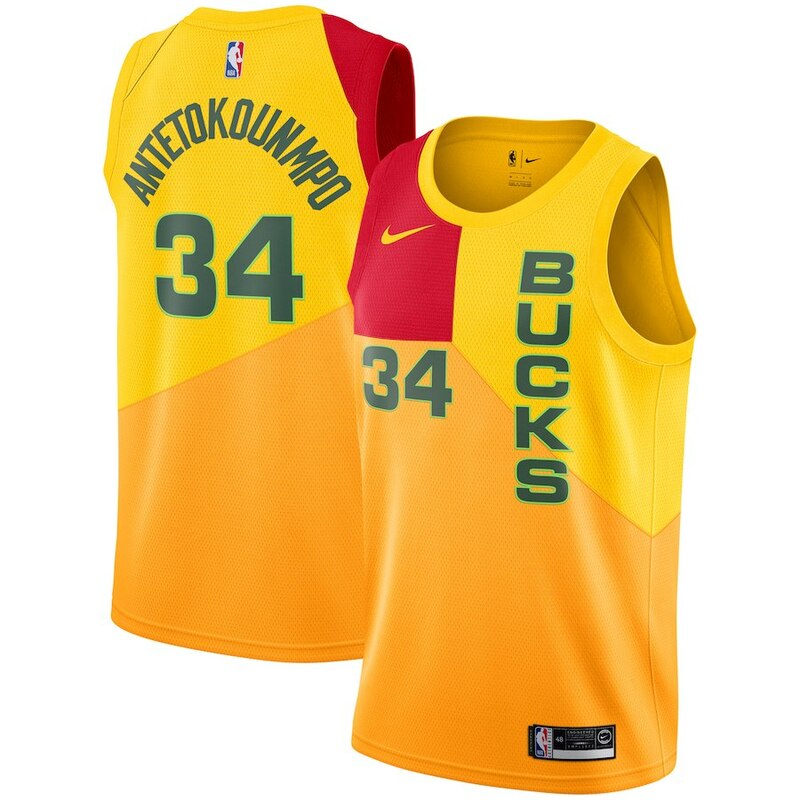 For the most part, the new jerseys were exciting takes with inspiration taken from a city flag, Prince (the artist formerly known as), Native-Americans and modern takes on throwbacks. All said, about eight teams announced their ‘City’ alternates last week and that just made us salivate for the remaining twenty-two teams. 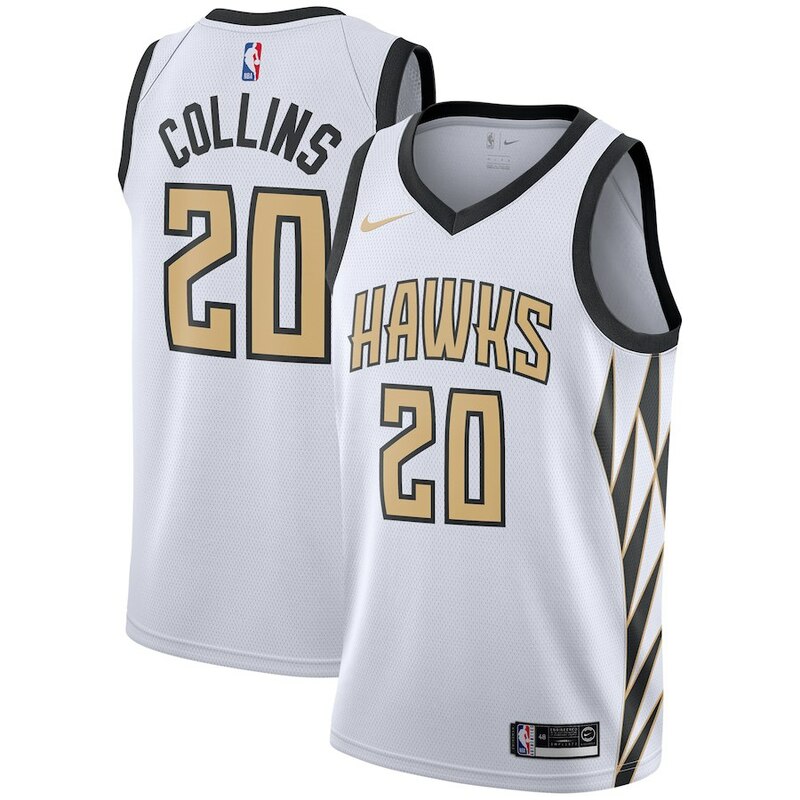 The Hawks City Edition Swingman Jersey is a departure from what we’re used to seeing from the franchise with a new Nike white colorway for the 2018/19 NBA season. The Atlanta Hawks new alternate uniforms surprisingly doesn’t feature Trae Young. Instead the ATL show off second-year forward John Collins. The new Celtics digs shows that you can still be simple and still give an upgrade. We’re digging how clean the new Boston alternate looks look. 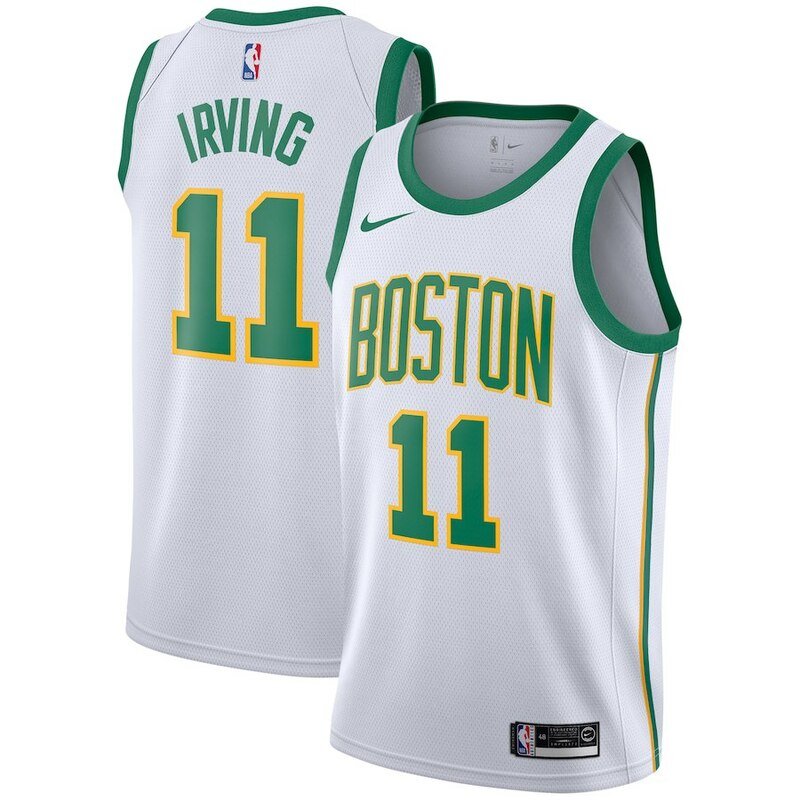 Above is the Boston Celtics Kyrie Irving‘s alternate Nike White 2018/19 Swingman Jersey (City Edition). 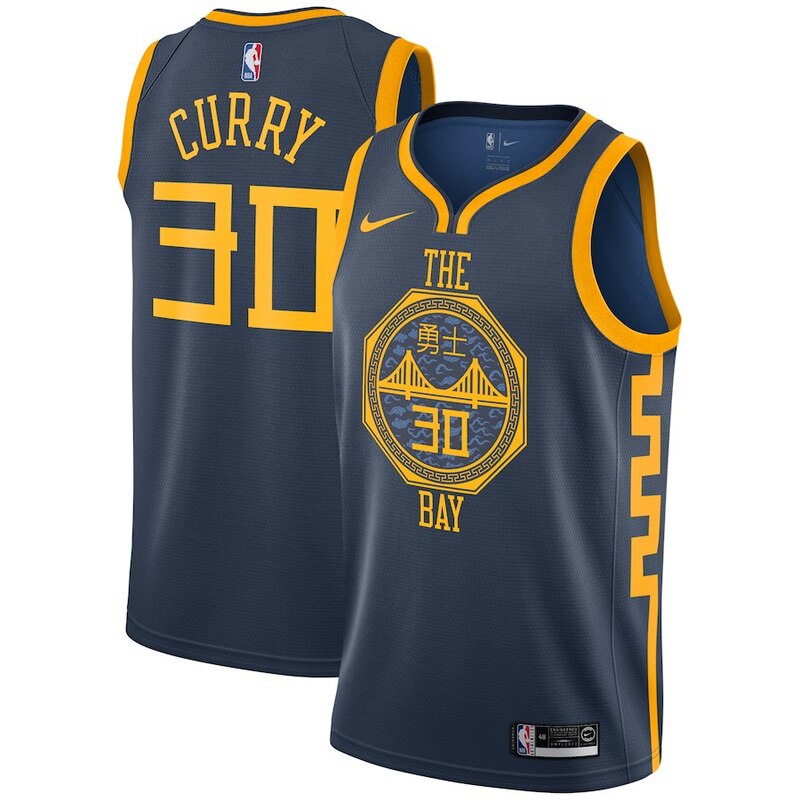 The Net’s new City Jerseys are a more contemporary version of last season’s jersets with a Notorious B.I.G. in Coogi inspired trim. Not sure if it’s officially partnered with the 90’s fashion brand or not, but despite the simplicity, the trim is a dope touch. 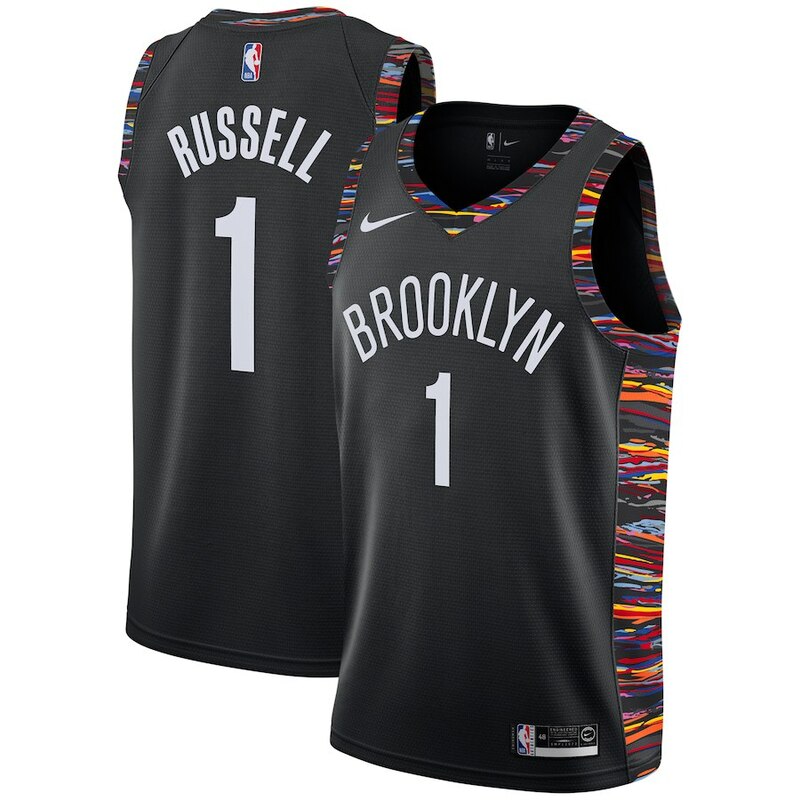 This is the men’s Brooklyn Nets D’Angelo Russell Swingman City Edition Jersey in Nike Black 2018-19. The Charlotte Hornets stuck with ‘Buzz City” nickname. 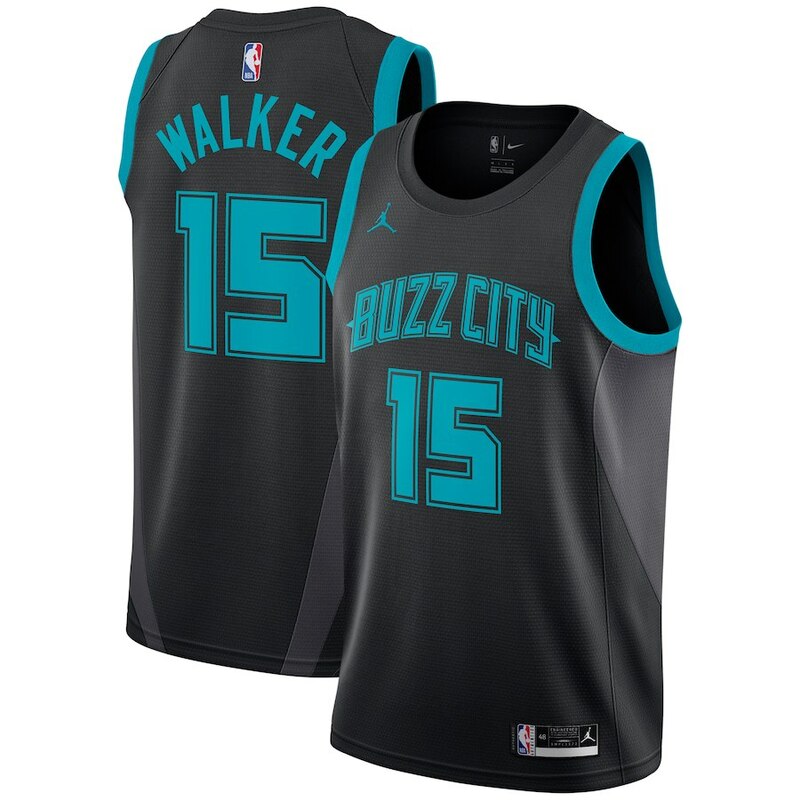 What do you think about the new “Buzz City” Swingman Black 2018/19 Jersey (City Edition)? 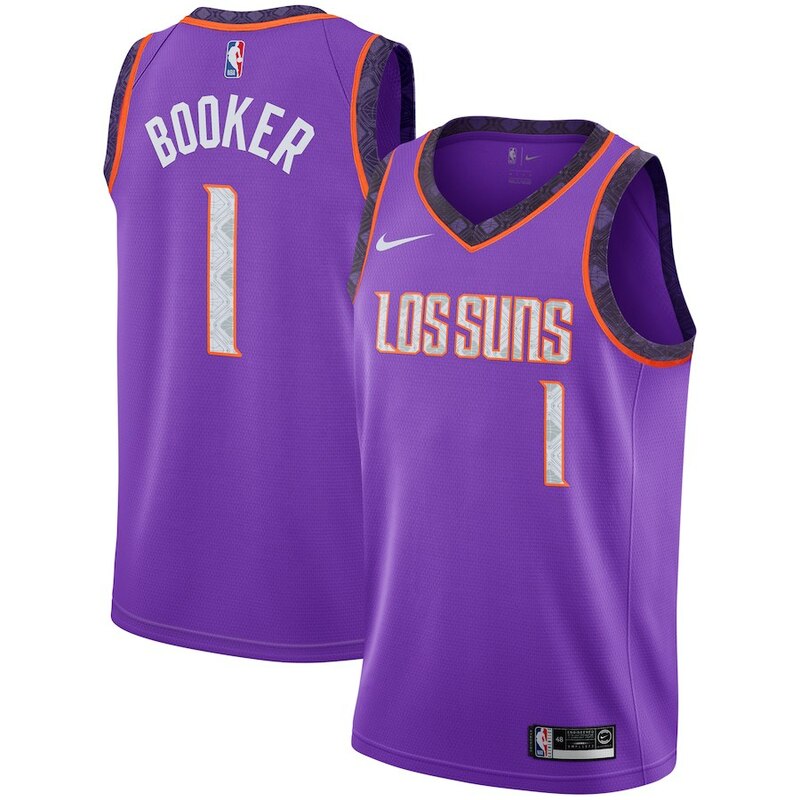 Pictured above is Kemba Walker‘s jersey. And because Charlotte Hornets is being run by Michael Jordan, it’s no surprise that Charlotte’s City Edition uniforms are Jordan Brand. 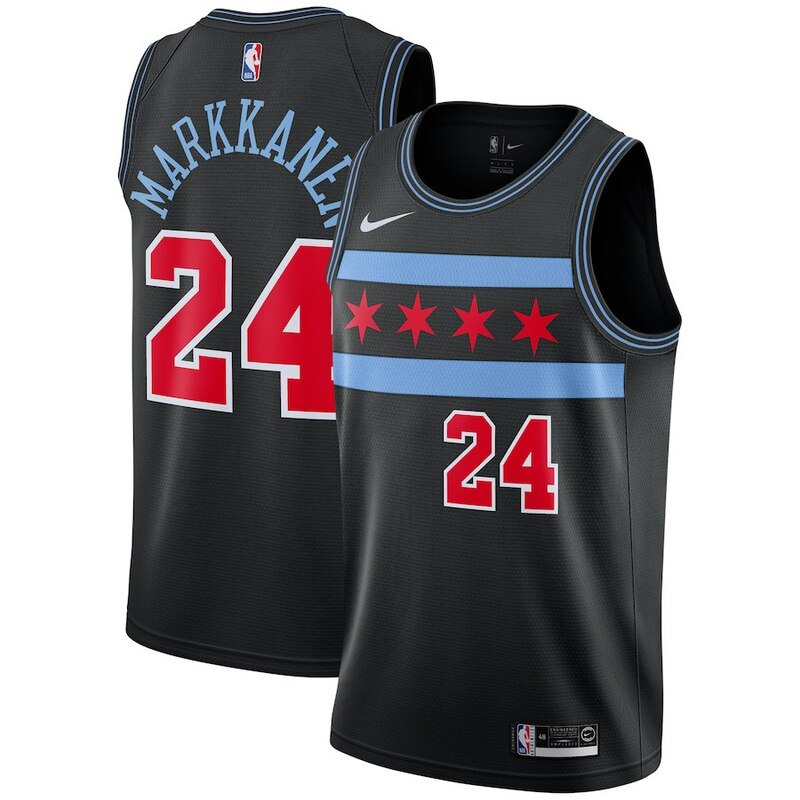 The new Chicago Bulls Lauri Markkanen City Edition uniforms are inspired by the city of Chicago’s flag with the light blue and red stars. We’re loving Nike’s new take on colorway for the iconic team: pictured above is the Black Chicago Bulls Swingman Jersey for 2018-19. Paying homage to the Cleveland Cavaliers’ old team logo from an era ago when Mark Price, Larry Nance (Sr.) and Terrell Brandon played for the franchise out of the midwest. 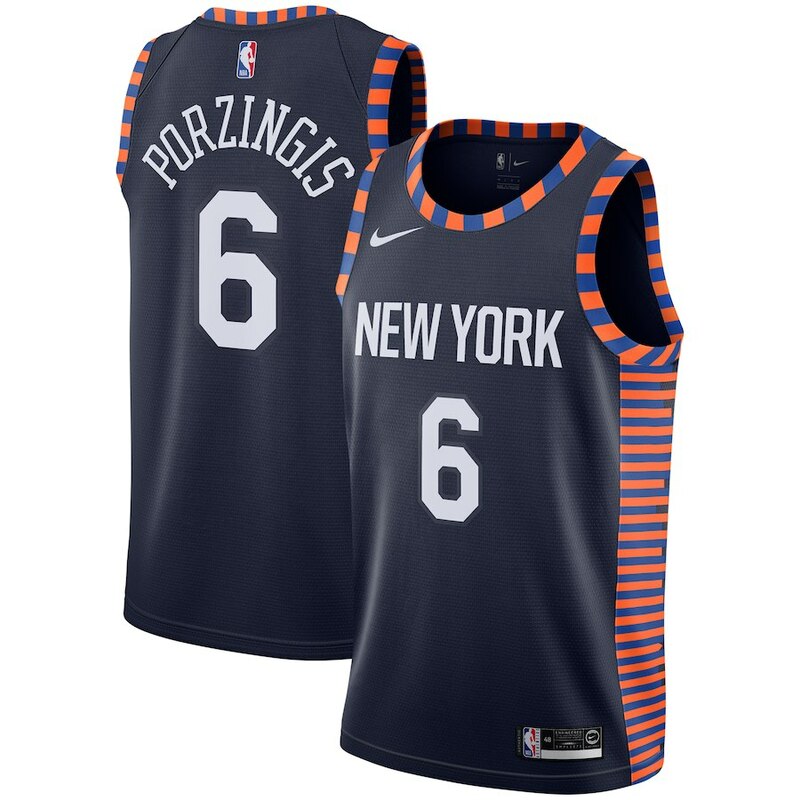 The new City Edition uniforms are color-blocked with blue and orange. 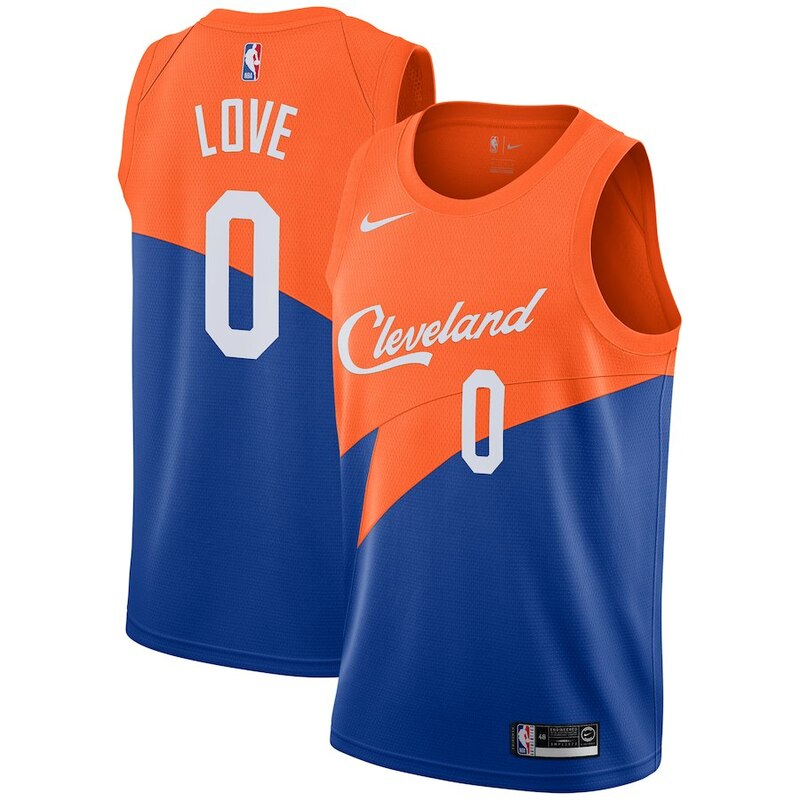 Featured above is the Kevin Love Nike City Edition Swingman jersey in blue. 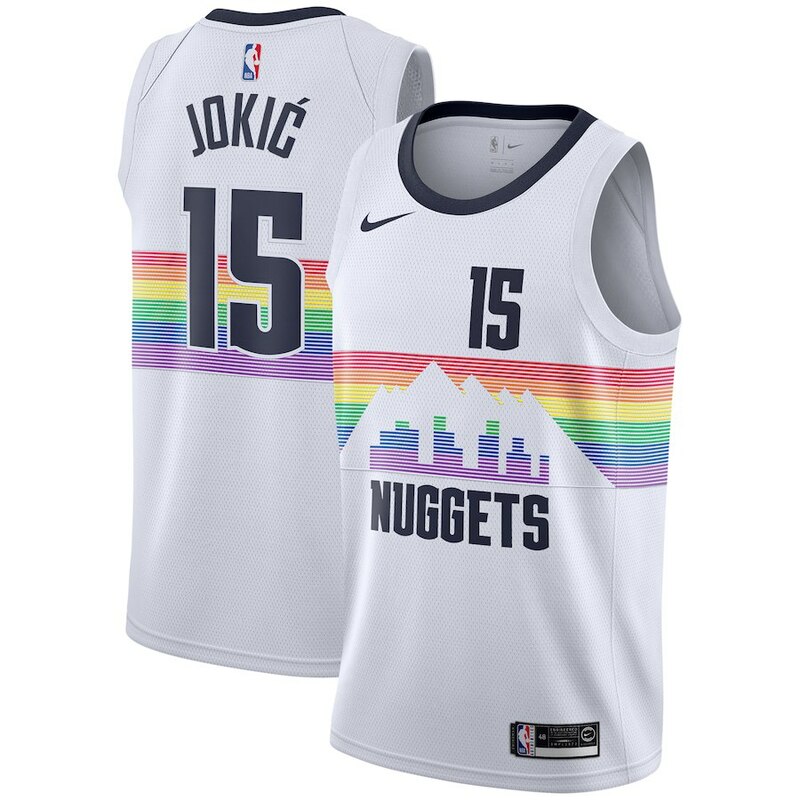 We’re a bit surprised the team didn’t go with “The Land” on this one. We think it would have added needed cool factor to the modern take. As we chatted about in our previous post, the Detroit Pistons new alternate jerseys from Nike are a departure from what we’re seeing from the franchise — not just from a colorway, but in overall design. 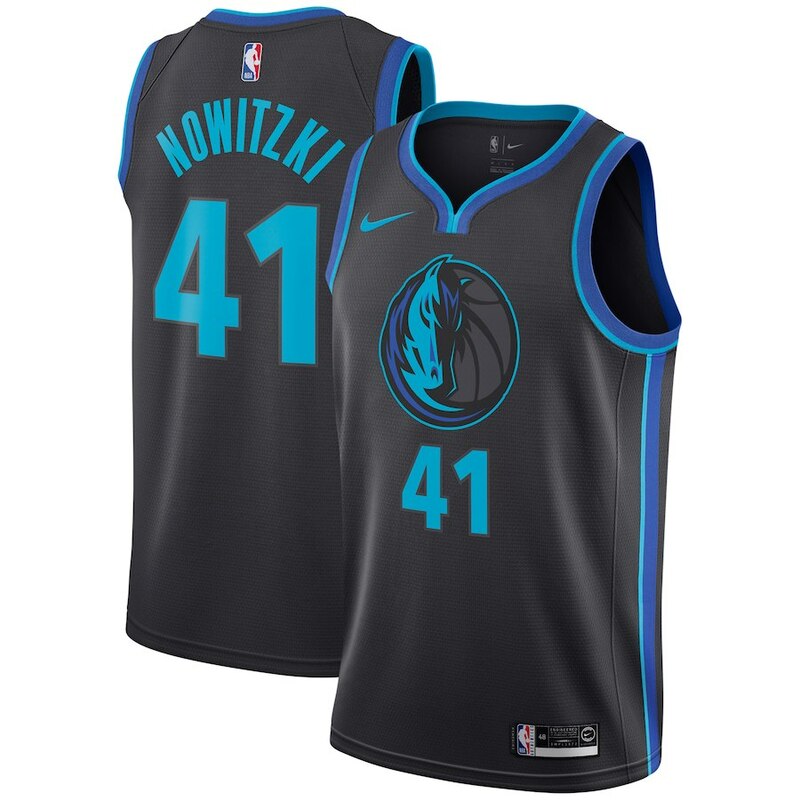 It’s nice to see D-Town get a sleek jersey with an extremely clean feel. 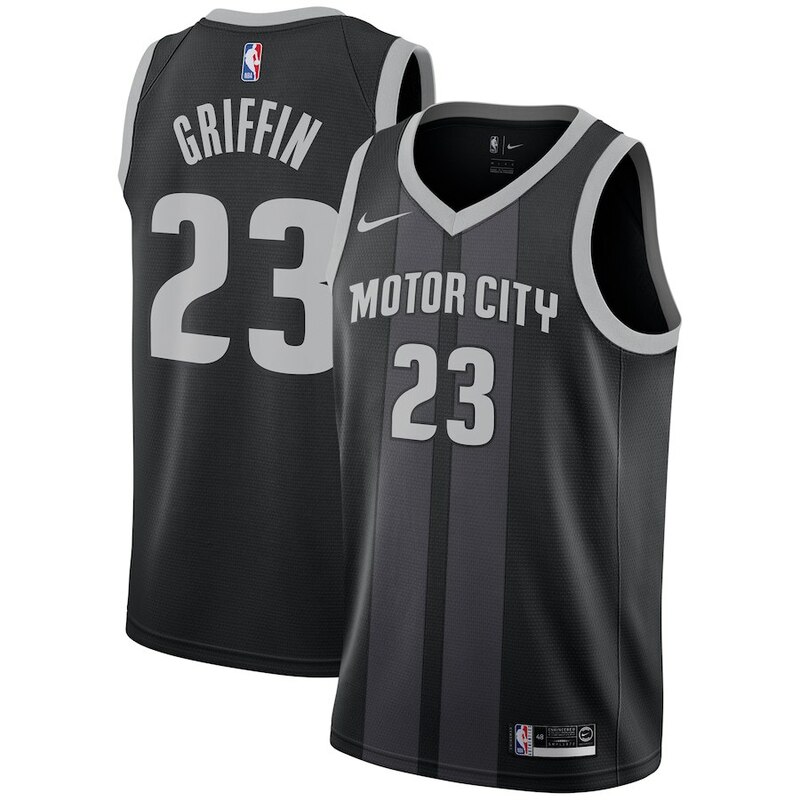 Pictured above is Blake Griffin‘s Nike Swingman City jersey in black and gray. Like Golden State, the Rockets’ colors have shifted from a less-brighter look to a darker, serious red seems and more of a metallic gold feel. 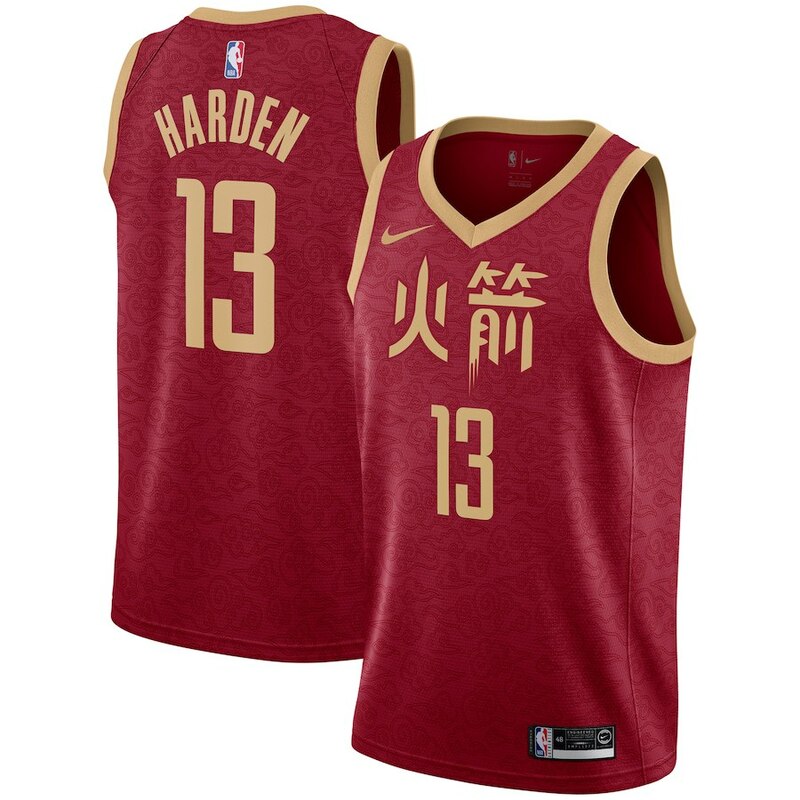 With the inclusion of two Chinese characters on the jersey, one can safely assume the updated colors align more with the importance of red and gold in Chinese culture. Every one of the new alternate jerseys are a little cleaner, but there’s something slicker about the new Pacers Nike jerseys. 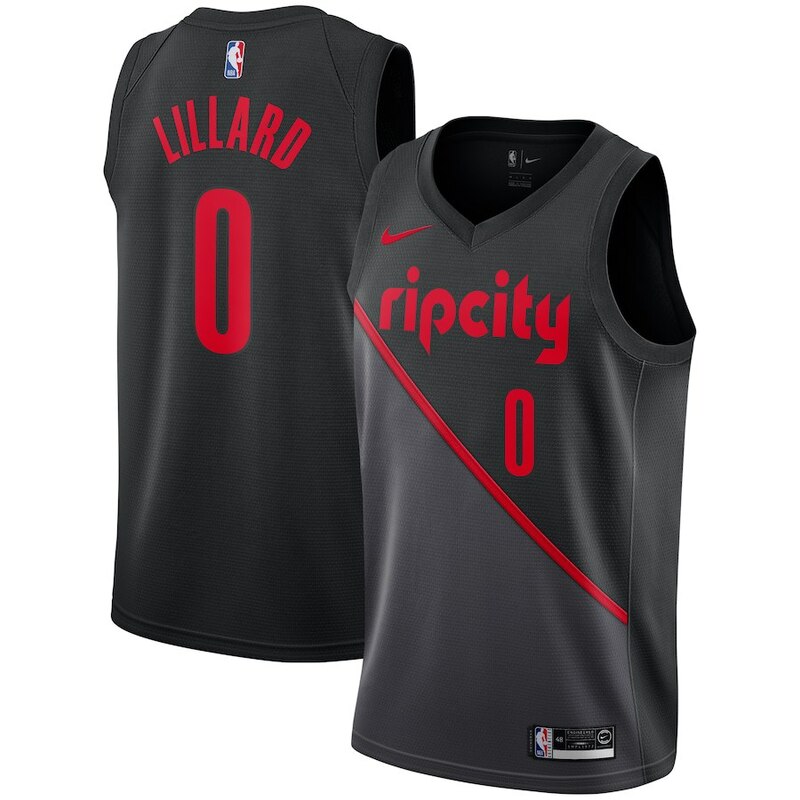 Their City Edition for this season is almost futuristic in terms of how clean and modern it feels. 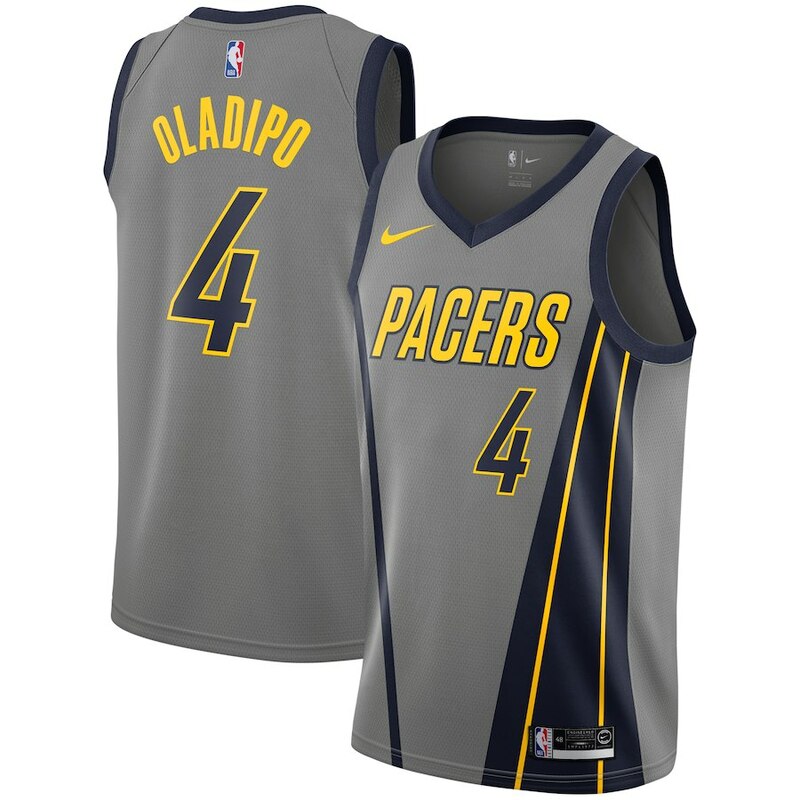 Pictured above is Indiana Pacers Victor Oladipo Nike gray Swingman jersey. I have to say, the Los Angeles Clippers new City Edition jerseys might be my favorite new alternate uniforms. 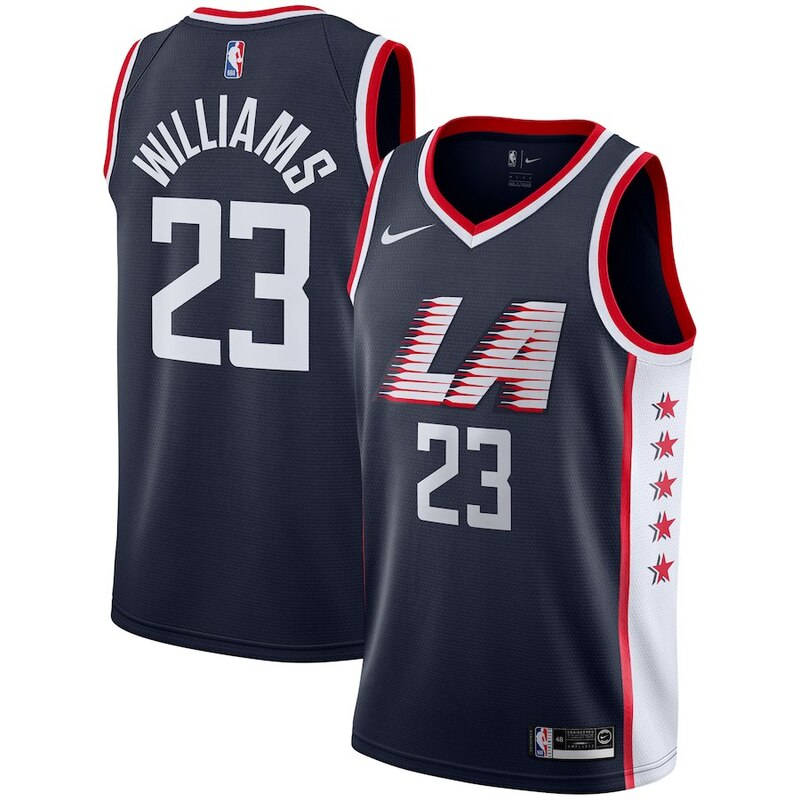 Nike’s new impressive uniform (feat Lou Williams) in navy/white/re star Swingman jersey is the most-modern re-imagined jersey in my book. We love the “LA” font “logo” and how the Clipper blue works on the sleek jersey material. 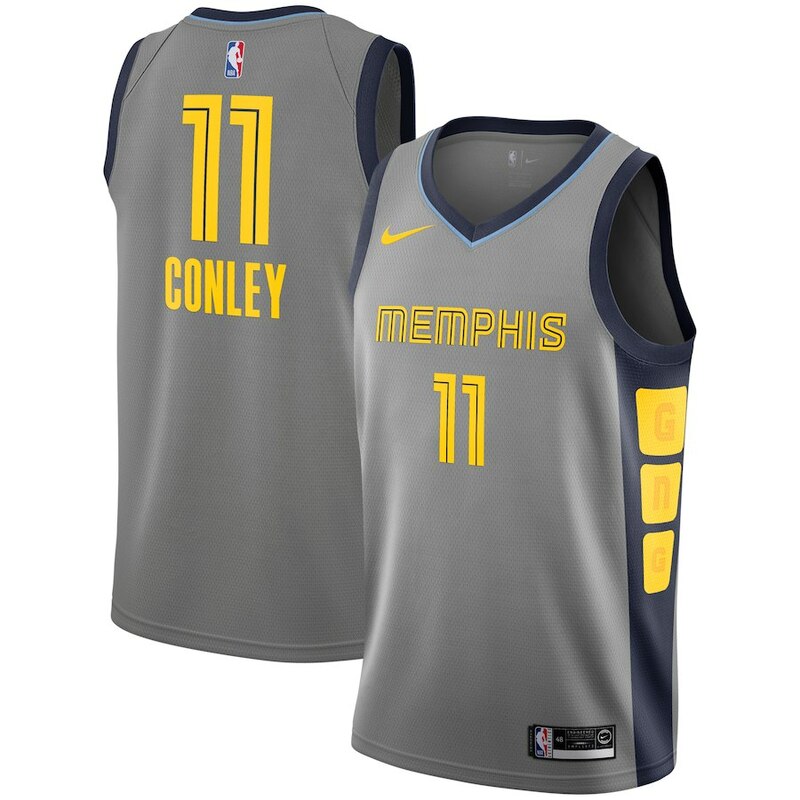 I can’t wait to see these on Tobias Harris, Boban Marjanovic, and Montrezl Harrell. If there was one team that captured the city-inspired City Edition jserseys 100% last year when they were introduced, it was the Miami Heat. The team based took inspiration from the colors associated with South Beach and Miami Vice. There’s not much anyone would improve upon from the neon blue and pink in a Miami Vice font as represented below. 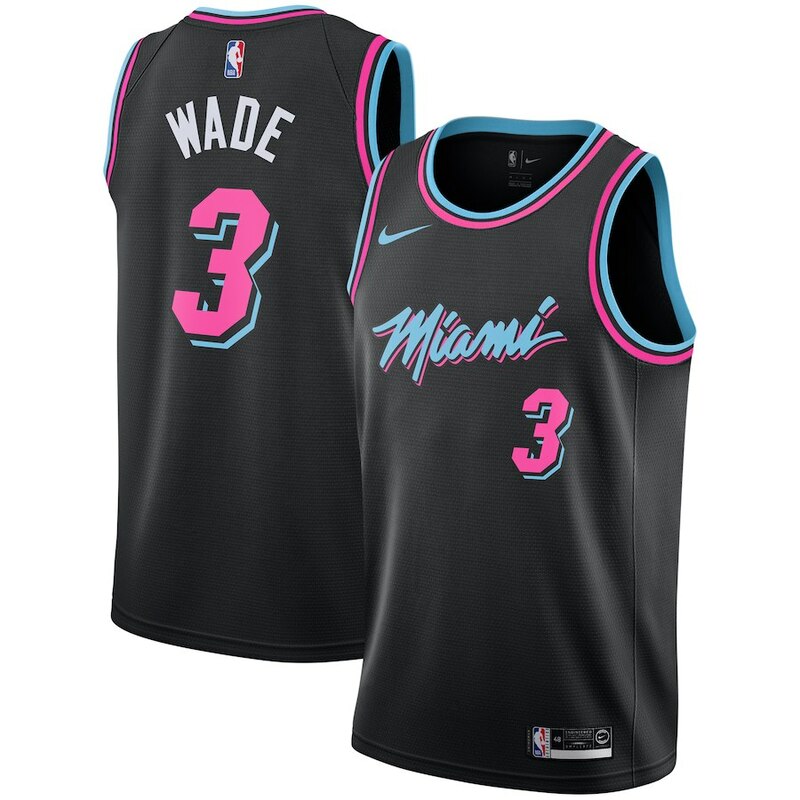 Above is Miami Heat’s Dwyane Wade Nike black Swingman Jersey for the 2018-19 season. The exciting new Minnesota Timberwolves jersey is inspired by Prince. The musical legend was born in the state and his estate is in Minnesota, so the franchise used Prince as their inspiration. The Wolves franchise worked with Prince’s estate, which incorporates multiple references to the legacy of Prince. From the font — which is reminiscent of the 1980s Prince era — to the tonal purple most closely associated with Prince, the uniform speaks of his legacy and bond with the state. We think it’s dope. 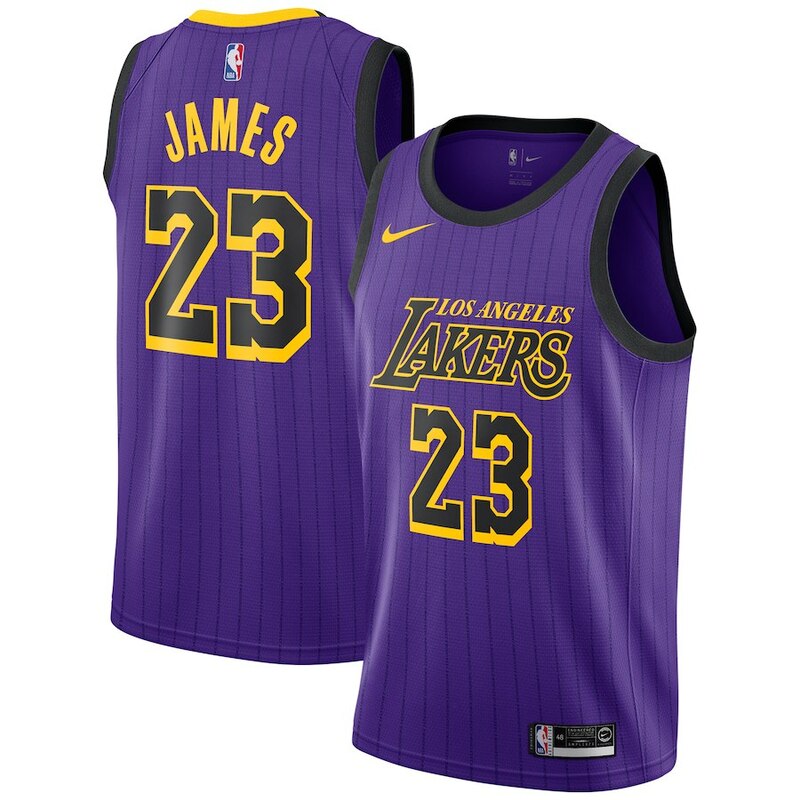 Here’s the Karl-Anthony Towns Nike black/purple Swingman City Edition jersey. We love the New Orleans’ newest City Jerseys. It’s another example of a simple, clean, minimalist look. With the clean, clear white as the majority of the area, the distinctive colors of purple, green and yellow of New Orleans, Louisiana becomes the star. 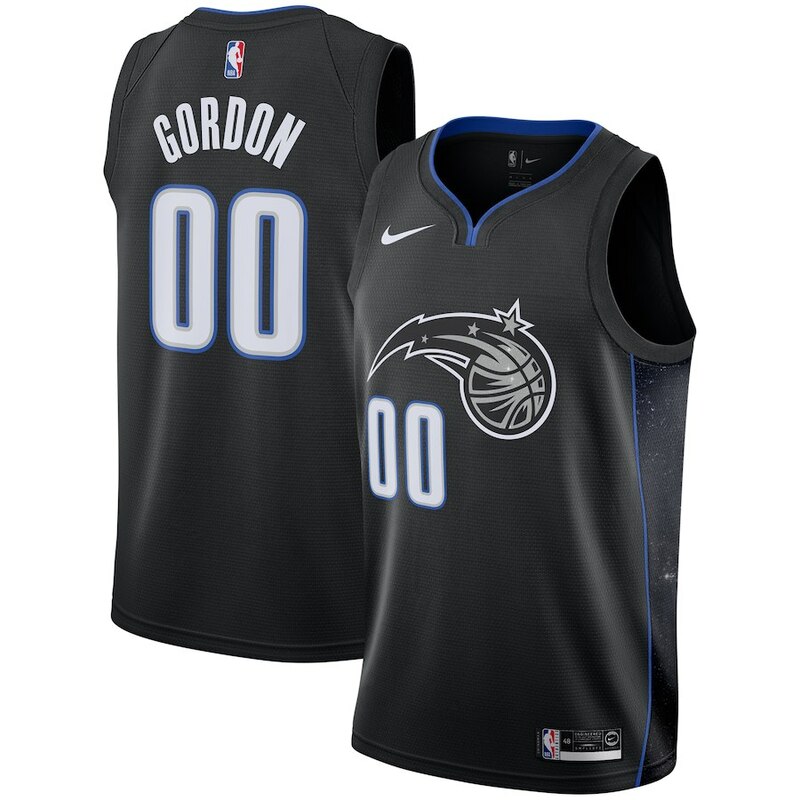 Though it’s clearly a contemporary design, the new alternate jersey gives us a retro feel. 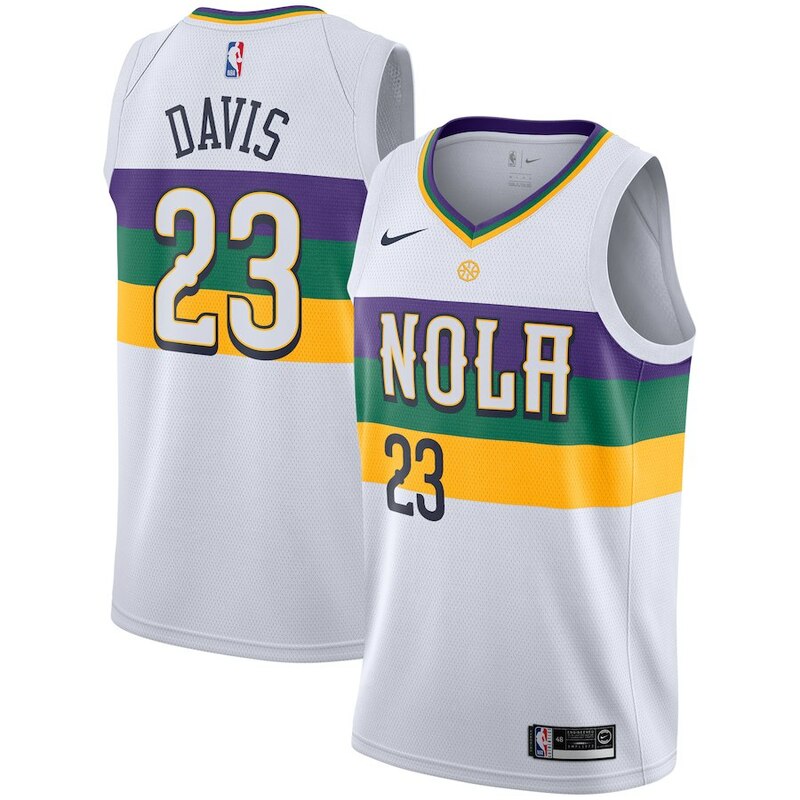 Pictured above is the Pelicans’ star Anthony Davis Nike White 2018/19 Swingman Jersey (City Edition). The new Thunder city jerseys were inspired by the rich Native American culture. This is Nike’s City Edition jersey for the Oklahoma City Thunder. 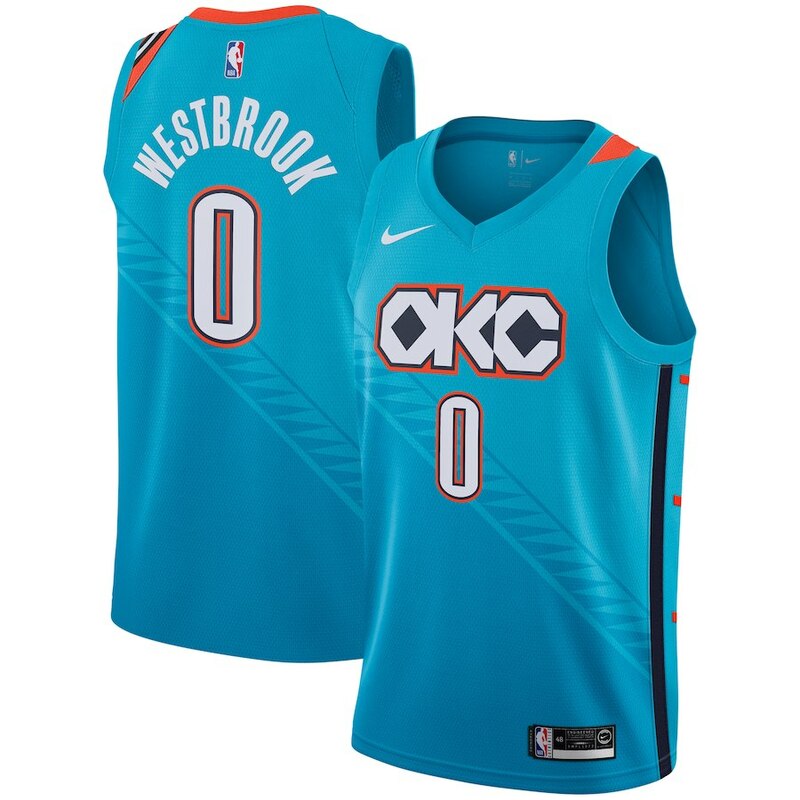 Above is Russell Westbrook Nike Turquoise 2018/19 Swingman uniform (City Edition). 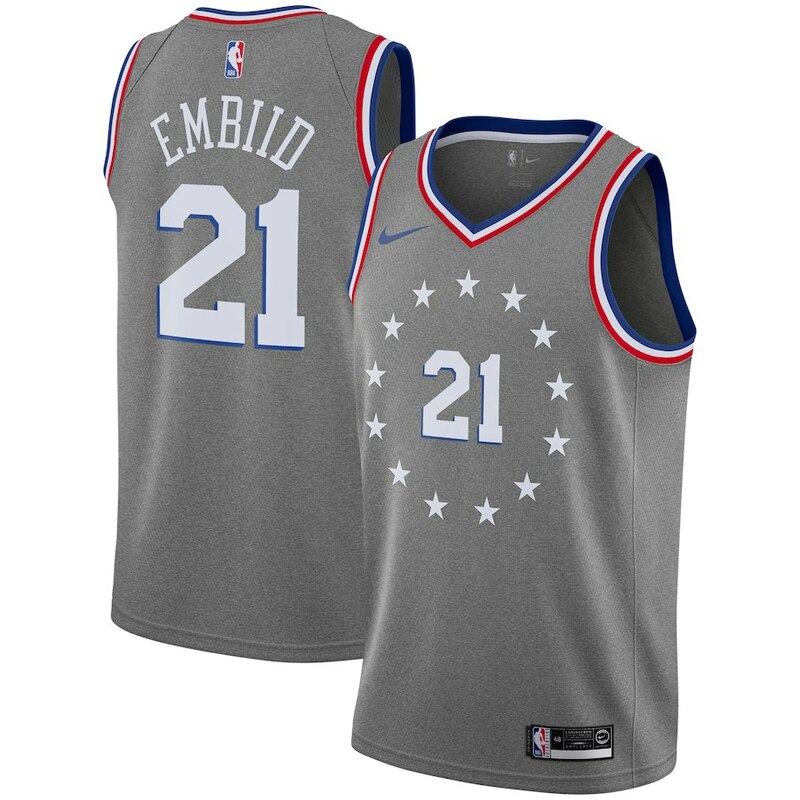 Above is the Philadelphia 76ers Joel Embiid city jersey in gray. Go to this post to see Ben Simmons modeling the new heather gray jerseys. We love the new Sacramento Kings Swingman alternates for the 2018-19 season. Last year’s version was about the same, but instead of the King’s logo, the team went with “SAC TOWN” the nickname of the city in a modern font outlined in red. 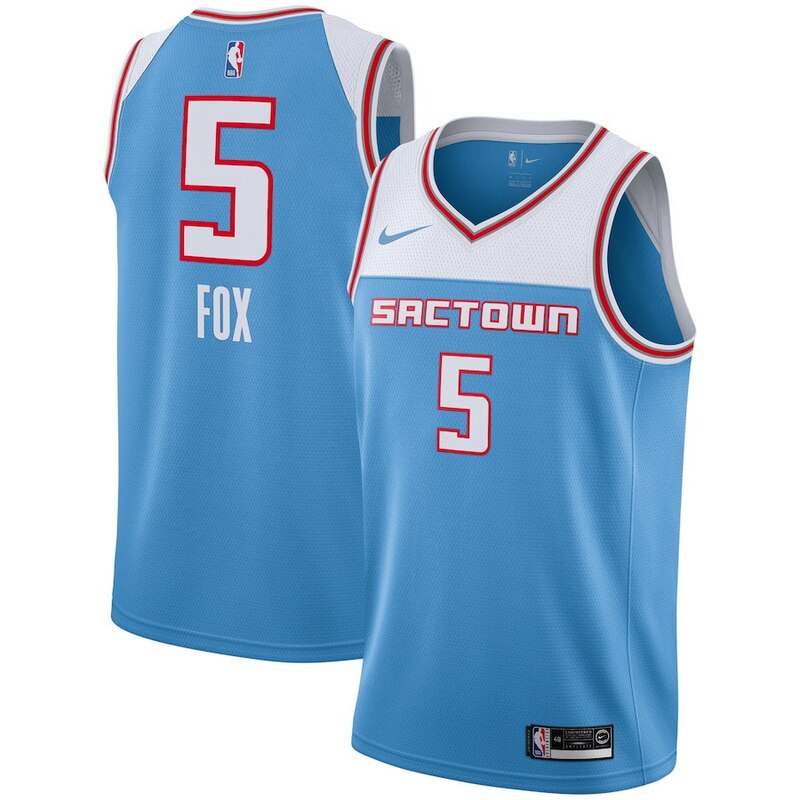 Featured above is second-year player De’Aaron Fox in the Nike light blue Swingman Jersey (City Edition). We’re a bit confused / happy that the San Antonio Spurs chose to feature Manu Ginobili for their 2018-19 Swingman Jersey. 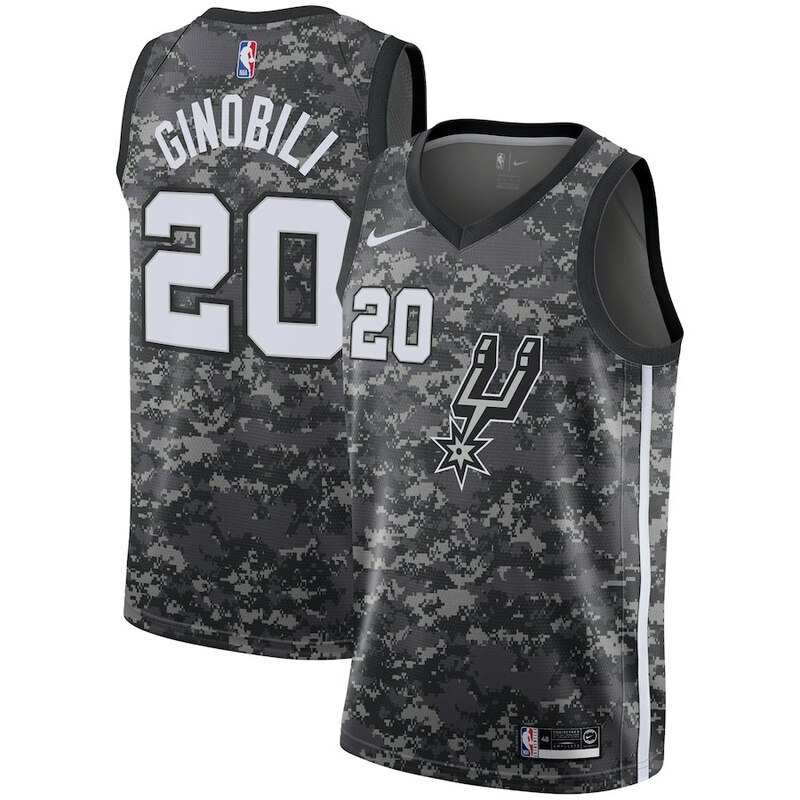 It’s nice to see the Spurs’ black and silver color play get an updated design in the form of camouflage. 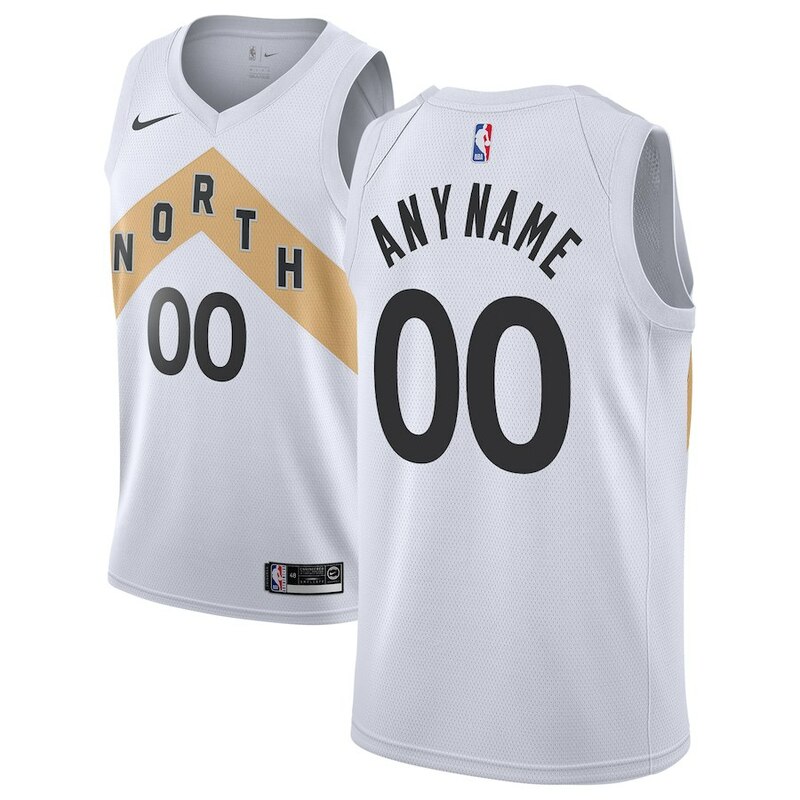 As much as we like the Toronto Raptors new ‘City’ alternates we must admit the Nike white Swingman jersey is almost too basic in it’s design. With a simple all-white look and gold banner pointing upwards, the team plays on the location of the only NBA franchise in Canada with the “The North” team motto. 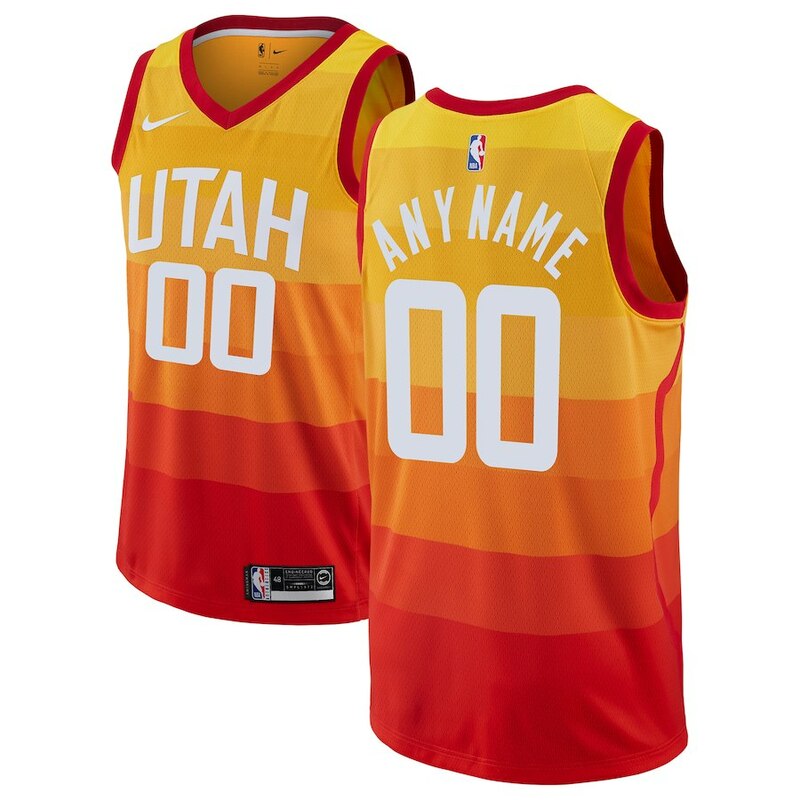 Above is the Nike Orange 2018/19 Swingman Utah Jazz custom Jersey (City Edition). 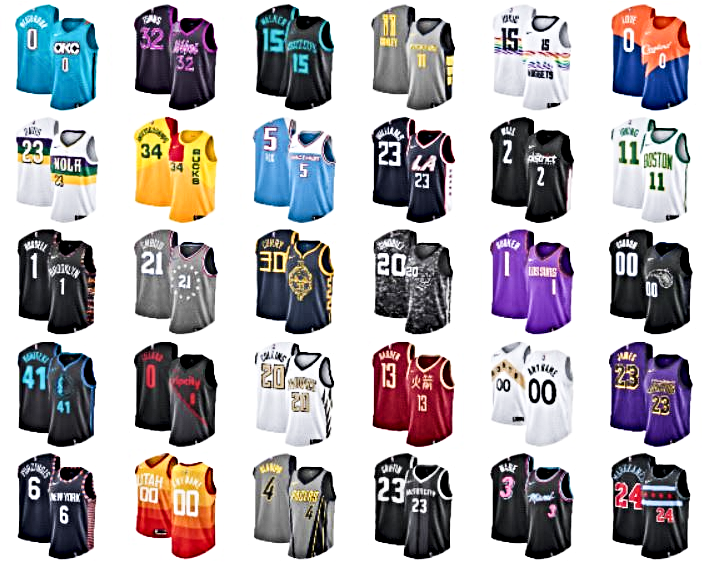 As we mentioned in a previous post, the Washington Wizards were one of the eight teams to announce updated city jerseys last week. 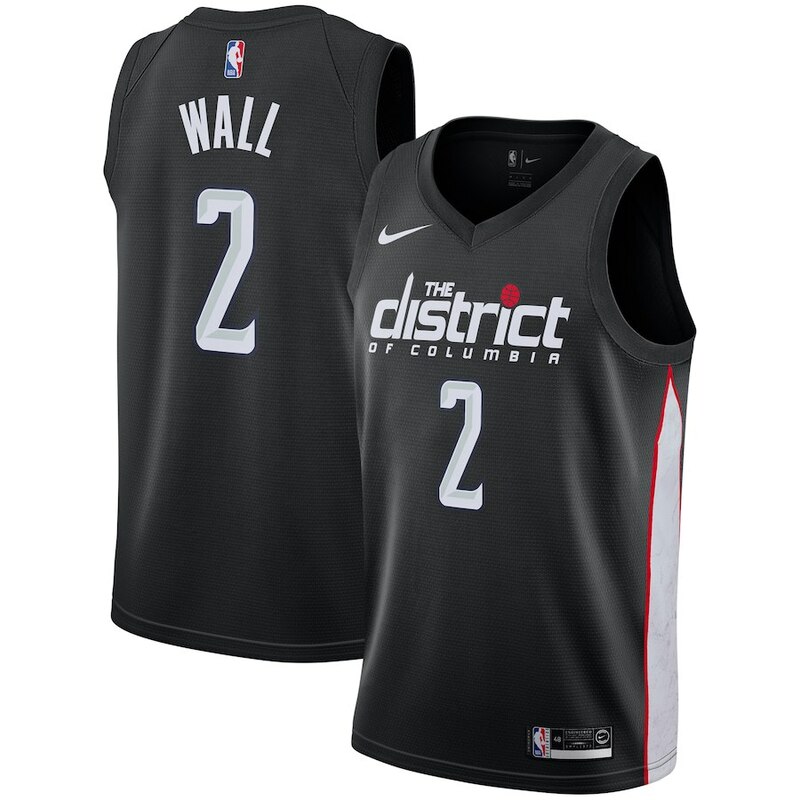 Featured here is John Wall in the new Nike Black 2018/19 Swingman City Edition uniform inspired by D.C.’s National Mall.